It is 1882. Horses, buggies, and wagons are common forms of transportation. Large crowds turn out to watch balloon races. The huge balloons are filled with hydrogen gas. Carlotta the Great is the best female aeronaut (balloon pilot) in America. On the morning of a big race, Ariel asks her mother, Carlotta, if she can ride in the balloon too. Carlotta says no, that racing a balloon is hard work, and that Ariel is too young. Ariel will need to ride with her father in the buggy to the finish line. When the family arrives at the race site, there is a big crowd. Many balloons are being inflated for the race. The mayor gives a speech. Carlotta tells Ariel that she can wait in the balloon basket until it is time for the race to begin. Ariel climbs in and grows sleepy as the mayor talks on and on. When Ariel wakes up, the balloon is in the air, and the race is on. The balloon can’t go as fast as it usually goes, and sinks in a draft, scraping treetops. “Can we go higher?” asked Ariel. Carlotta empties sand over the side, and the balloon rises. They have a few adventurous moments – being pulled in an updraft into a raincloud, sailing low over a town, and narrowly missing a steeple. Finally they see the lake and the finish line on the other side. Carlotta catches a good wind that blows them over the lake. However, the gas in the balloon begins to cool and the balloon sinks. Carlotta and Ariel throw everything out of the basket that they can, but the balloon still sinks. Their basket lands in the lake, with the balloon floating above. Carlotta is surprised, and tells Ariel that was brave. But, the basket is too wet and heavy for the balloon to lift, even without Ariel. As another balloon appears and begins to descend, Carlotta throws Ariel a rope and Ariel pulls the basket and balloon to shore. They win the race. “I’m proud of you, too,” she said. This story is based on the lives of the Myers family of Balloon Farm in Mohawk Valley, New York. Carl Myers was an inventor and balloon maker. Carlotta was an expert balloonist in America in the 1880’s. Their daughter, Ariel, became a balloonist, too. This is a fun story with strong female characters. My daughter loved hearing and reading this story frequently. 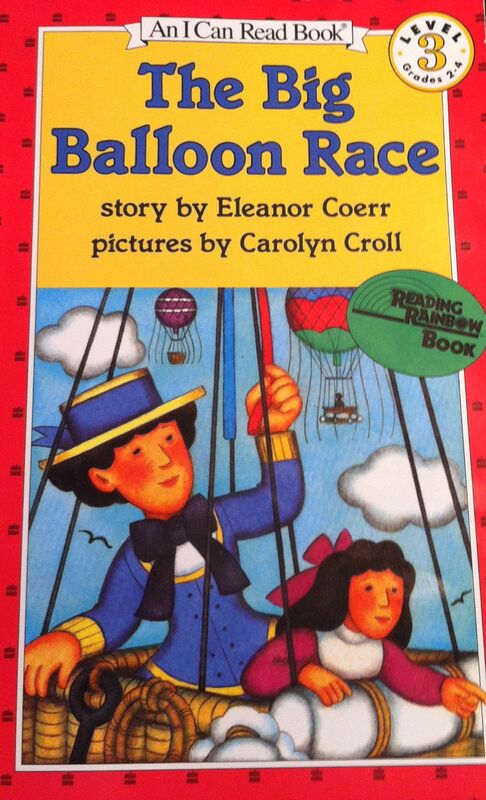 The Big Balloon Race is an I Can Read Book, Level 3. Just stopping by from the Kid Lit Blog Hop. Thank you for sharing your thoughts on The Big Balloon Race. I enjoyed your post. Thanks for stopping by from the Kid Lit Blog Hop! Nice find! I have been disappointed by the collection on the I Can Read series and just abandoned them for reading practice. So its nice to find a story that we would like and also complements independent reading! Thanks for sharing this on Kid Lit Blog Hop! We, too, had mixed feelings about so many of the I Can Read books. This one was a hit in my family, though. We checked it out from the library so many times that we ended up buying a copy. Thanks for stopping by from the Kid Lit Blog Hop! How interesting, I do love balloons. I was a little concerned when Ariel jumped into the lake. How did the kids take that part of the book. ( I am a huge prude when it comes to swim safety lol) Thanks so much for linking in to the Kid Lit Blog Hop. I think Ariel jumping into the lake surprised me the first time we read this book – possibly because she is shown dressed in clothing proper for a girl in 1882. In this scene, the balloon is shown floating just above the surface of the water, and the shoreline is very close. It doesn’t look dangerous in the illustration. I’m terribly uptight about children in water and swimming safety myself, and this didn’t set off my water-alert sirens – which is odd as most things do. 🙂 Thanks for stopping by from the Kid Lit Blog Hop!